18 Private Acres. Spectacular Views. Unwind. Breathe Vermont's famous fresh air. This is the perfect country retreat. Vermont's famous fresh air from the 18 acres of tranquil woodlands and trails surrounding this spacious, comfortable, cheery country house. Picture windows and a wrap-around deck look over Hidden Valley's miles of hills, fields and streams into the next state. With 3600 square feet of living space, the house offers several gathering areas, including two separate living rooms, a game table area, a dining area and a sociable kitchen. Grill on the deck and eat with breath-taking views. Marvelous for retreats, reunions, family gatherings, writers and artists. Great for three couples, one per floor. Furnished down to the cookbooks. There are games galore, hundreds of well-chosen books and over 200 movies on video. Artisan stonemason Simon Shultz created magnificent two-story stone columns that support the outside deck and, at the heart of the chalet, a spectacular three-story stone core with two fireplaces. 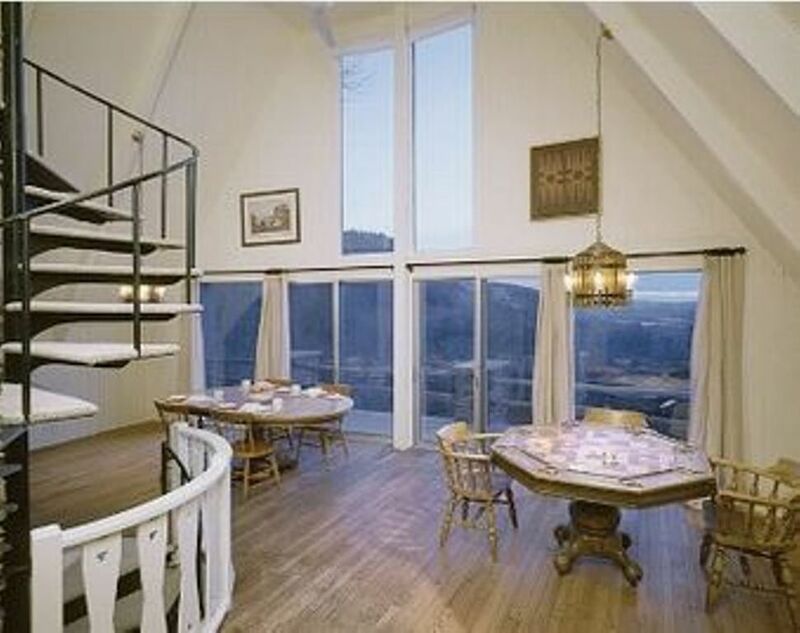 A charming spiral staircase connects all three floors. Sleeping accommodations: The total number of beds in the chalet are: two twin beds, two queen beds, one queen sofa bed and one double sofa bed. The two twin beds are in the ground floor bedroom. The main floor bedroom has one queen bed, the third floor bedroom has a queen bed. The chalet has two separate livings rooms, one on the ground floor and one on the main floor. The ground floor living room has a double sofa bed that can sleep two persons. The main floor living room has a queen sofa bed that can sleep two people. All within an hour: learn Fly Fishing at the Orvis Fly Fishing School or visit the American Museum of Fly Fishing in historic Manchester village: the Norman Rockwell Exhibition, where Norman Rockwell's models are your tour guides, at the Arlington Gallery in Arlington, hometown of Norman Rockwell 1939-53, on historic Route 7A; the world- famous Simon Pearce Glass-Blowing workshop and restaurant in Quechee, VT and the noted Billings Farm Museum in Woodstock, VT.
We love this view. Marvelous artisan stonework throughout RYE CHALET. Lifelong friends with original builders Olie and Jinny Rye. Vermont's famous fresh, fresh air supplied by the countless trees. We can feel ourselves relaxing. Sweeping mountain and valley views, all the way into the next state. Wells, Vermont, population 900, is one of Vermont's 250 small towns. The lovely Lake St. Catherine is right in Wells, about a five minute drive from the Rye Chalet. Spectacular view down valley and into New York state. Beautiful stone fireplace in the main floor living room. We provide firewood for your first couple of fires. More available from firewood suppliers around town. 1 gig up and down all-house internet connection for those “stay in by the fire place” days including an Echo on the main and first floor. TV in the main floor living room. Second TV in the ground floor living room. All the spices you want. Two TVs -- one each in the main floor living room and in the ground floor living room. Well stocked library on the ground floor. Bring your own kayak. Launch at Lake St. Catherine, 10 minute drive. Big view looking out over Hidden Valley. Ski at Bromley, Pico, Killington. Rye Chalet is central to all three. At Lake St. Catherine Country Club, about five miles from Rye Chalet. RYE CHALET has Wi-Fi and satellite TV. Delicious and beautiful take-out or catered meals are available from Kathryn Vanderminden, a first-rate chef in Wells (villageroots@gmail.com or call 802-282-8676), who emphasizes local, fresh ingredients. Full meals, picnics, soups, appetizers and desserts for take-out or serving...or for catering weddings and other events at the RYE CHALET. Second living room seats seven. Washing machine, clothes dryer, iron and ironing board are in the laundry room. Guided hiking, hunting and/or fishing tours with a Certified Hunter-Safety and 'Let's Go Fishing' Instructor can be arranged for an additional fee -- for all levels from child to expert. We will consider pets. Tell us the details -- size, breed, age, etc. Our pet rules: don't allow them up on our furniture, and don't leave them alone in the chalet unless kenneled. One dog $30/night; two dogs $40/night. Weekly rate $100 for one dog, $150 for two dogs. Two dogs max. We really enjoyed our stay. It was everything we hoped for in the views and surroundings. The home was fantastic and we enjoyed our down time there. It snowed when we arrived so it was a win all around. The homeowner was informative and prompt in communications. We had a lovely family vacation at rye chalet. Everyone would like to return next year. I realize the cost is kept down by not purchasing anything that needs updating. However, a television that was a little bigger and clearer for the second floor would have helped. Surely that can be afforded without increasing the cost? Maybe a newer coffee maker too? Everyone else in the family didn’t mind the remoteness of the chalet but since I was also on vacation & didn’t want to prepare meals, it was at least an hour round trip for anything. ML was extremely helpful with all of our needs and very accommodating. Thanks for your feedback. We appreciate it. At present, the size of the TV is limited by the size of the TV cabinet.We'll keep your comments in mind for future renovations. Yes, stores in the country are not as congested as in the city. Next time, we suggest the wonderful caterer recommended in our Guest Manual. She is right in our small town and has lovely home-cooked meals and dishes for take-out. On your vacation, you should have a vacation from cooking. We'd love to have you all back and will happily give you our 10% Friends & Family discount for returning guests. This was our second time at the Chalet. The home is very nice and has quiet surroundings. We went snow tubing nearby and took a nice hike on the property. We would recommend this choice to anyone looking to spend some time in Vermont. Beuatiful Property, Well Maintained. Remote. Mary Lee was a fantastic host. All amenities were as described and the property was in great condition. It was a little tough to get to the location given the weather, but ML even went and made sure there was a place for us to secure our cars that got stuck in the unanticipated mud. Serene, spacious, and super comfortable. Hope to return! Thank you for your kind comments, Lindsey. The feeling is mutual. So glad you connected with Village Roots Catering. We are so lucky to have a world class caterer here in tiny Wells. Hope you'll come back and take advantage of our 10% Friends & Family discount for our returning faves. Such a wonderful place in the woods. We really enjoyed the quietness. My wife and I enjoyed walking around the grounds. A map of the property would be handy. Maybe think about a few updates, such as larger TV, larger microwave and the guest info book. Other than that the place had everything we needed to have a relaxing week away. This area of Vermont is just full of small towns and windy roads. We took many drives around the area. Things, such as covered bridges, are a lot closer to get to than they look on the map. I do not know if it was just this time of the year, but most restaurants in the area did not open until 5pm, or only on the weekend, and need reservations. Even the internet is not up to date on info. Call ahead before you go. Don't expect your cell phone to work unless you find jus tthe right spot in the woods. Of course, that can be a good thing. Thanks so much for your compliments and your suggestions. A larger TV is already in the mix. Hoping to get specifics from you about what further information you would like to see in the comprehensive Guest Manual. We hope you'll come back to Rye Chalet and take advantage of the 10% Friends & Family discount we give to returning guests. Visit charming Manchester, the original outlet town, the charismatic Northshire Bookstore, Orvis' glorious flagship store and great restaurants. Browse picturesque Vermont towns, antique, craft and art shops, the Vermont Country Store. Professional summer theater at Dorset Playhouse. Fly fish at Orvis Fly Fishing School or local lakes and rivers. History at President Lincoln's son's estate, Hildene, or Fort Ticonderoga. Lake St. Catherine (right in Wells) and Bomoseen Lake (in Castleton) offer canoe and kayak rentals. The private Lake St. Catherine Country Club in Wells has an 18-hole golf course open to the public. Miniature golf in Wells. Hike the Long Trail and Appalachian Trail. Ski resorts Killington, Pico, Bromley and Stratton offer summer alpine slides and scenic chair lifts. Drive to Shelburne Museum, Calvin Coolidge's home in Plymouth, the Robert Frost Trail in Middlebury, the Grandma Moses Museum in Bennington, tour Ben & Jerry's factory in Waterbury. Other Activities: Shopping in Manchester, VT, the original outlet town. Golf: The Rye Chalet has it's own golf pitching area. The Lake St. Catherine Country Club, right in Wells, offers an 18-hole golf course and club house. There are numerous other golf courses within driving distance, such as Castleton, Vermont and Whitehall, NY, both about a 20 minute drive. Two PGA 18-hole championship courses are under an hour's drive: Killington's Geoffrey Cornish-designed par 72 course and the Golf Digest award-winning Green Mountain National Golf Course. Most courses are open mid-May through October. Ski: The Rye Chalet in Wells, Vermont is central to all the major Western Vermont skiing areas -- Bromley, Killington, Stratton, Pico, Magic and Okemo. All are about 30-50 minutes away. The nearest is Bromley at about 25 minutes. Killington is about a 45 minute drive. Those skiing Killington or Pico often stop in Rutland for dinner at a wide variety of available restaurants en-route back to the chalet. Those skiing Bromley or Stratton often choose to have dinner at one of the many excellent restaurants in Manchester en-route back to Wells. You may choose either a $200 refundable damage deposit, or a $59 non-refundable insurance policy. The refundable damage deposit appears as our default option, but it is easy for us to change it to the non-refundable insurance policy if you prefer. We will consider a dog. Tell us the details -- size, breed, age, etc. Our rules: do not allow them up on the furniture, and do not leave them loose and alone in the chalet more than four hours. Kennels are fine. We give a $100 discount for your second rental week. 10% Friends & Family discount for your second visit and all visits thereafter.